Desert Academy, Santa Fe, USA "Really fast and happy with the service received. Thank you, ApplianSys." Afzal, Ministry of Gender, Maldives "What we find most impressive about CACHEBOX is that it handles YouTube video content." Qatar International School (QIS) is an English-speaking private day school located in Doha, the capital city of the State of Qatar. It is one of the largest schools in the country with 1,900 students and 300 teachers. Fast and reliable internet access is very important for international schools. Students and families demand high-quality education with the support of the latest technologies and resources. In 2017, QIS was finding it hard to deliver on that requirement. Despite having upgraded their bandwidth twice, from 16Mbps to 32Mbps and then to 50Mbps, the school’s growing number of fixed, mobile and personal devices was continually saturating their internet connection. 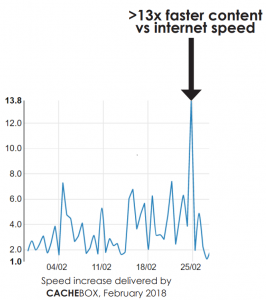 Technicians were routinely receiving a high volume of complaints about slow connectivity, particularly when students tried to view YouTube content simultaneously, as directed by the teacher. and in the background, large software updates from the likes of Microsoft and Apple were also consuming significant bandwidth – many times over. “We were suffering from congestion and slow internet speeds. We used to receive complaints from teachers as they could not use the internet the way they wanted to,” said Ashraf Said, IT Manager. As a result, the internet would often crash, bringing independent learning to a halt and disrupting teachers’ lesson plans. In the end, YouTube had to be disabled just to allow access to general internet content in the classroom. By installing CACHEBOX – a schools-focused caching solution that saves internet objects locally and serves all further requests via the Local Area Network (LAN), without using bandwidth – QIS has found a solution that doesn’t involve another bandwidth upgrade. paying for performance and features they don’t need. Harminder Heer, Sales Specialist at ApplianSys, worked closely with Ashraf and together they opted for CACHEBOX230 – a mid-range appliance designed for large schools that can support up to 3,000 concurrent users. This offered the perfect price/performance ratio for budget and traffic-load requirements. Now, multiple and repeat requests for content can be served locally, without it having to be downloaded from the internet each and every time. Whole classes can access content simultaneously, without waiting. This is freeing up bandwidth and making even more new content accessible in the classroom. Bandwidth consumption associated with software updates for all active devices throughout the campus has been dramatically cut. Updates from Microsoft, Apple and antivirus suites are now downloaded just once, when the first device is updated. All subsequent device updates are served directly from cache, leaving the internet clear for other more vital learning content. In its first month of use (February 2018), CACHEBOX served almost 500GB of the near 1TB of content that students requested but did so locally from cache, reducing demand on bandwidth by 54%. In that same month Microsoft updates accounted for 372GB of material, however CACHEBOX served 361GB of that locally, leaving just 11GB that came from the internet – a reduction of 97%. With staff also pre-loading teaching resources to the CACHEBOX Media Library ahead of lessons, the need for on-demand internet requests in the classroom is often eliminated altogether. The faster access to content is benefiting the learning experience. No wait times means no time wasted – students are far more engaged and focused, especially at the start of lessons when they download resources on their individual devices at the same time. At these peak times, demand has been recorded at over 800Mbps – 16 times the capacity of the school’s actual bandwidth. But CACHEBOX is able to serve these demand spikes locally and deliver the content at LAN speeds, often many times faster than the internet. ApplianSys consultants work with schools to determine the best-fit solution for their individual requirements, taking into account student numbers, campus structure, network infrastructure, internet capacity and more.